Rochester, NY, June 22, 2018 --(PR.com)-- Molecular Glasses, Inc. has filed for patent protection for its "Solvent Coatable OLED Emitter Composition Containing Metal Nanoparticles and Emitter Materials in Noncrystallizable Molecular Organic Semiconductors." This filing expands Molecular Glasses patent portfolio and converts a provisional application into a full US patent filing. The technology covers inkjet emitter ink containing metal nanoparticles. 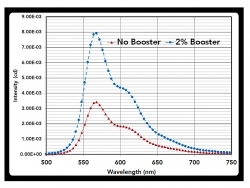 The new ink formulation boosts the light output of the printed OLED by 150%. "This new technology, coupled with the company's patent-pending solution OLED manufacturing process, will help Molecular Glasses leverage its patented OLEDIQ™ soluble hosts into high-value-added OLED inks for lower manufacturing cost as well as increased light output," notes Mike Molaire, CEO and Founder of Molecular Glasses. "Molecular Glasses has assembled a remarkable team. The company's senior members have over 120 years of experience in research & development, chemical manufacturing, business development, marketing and sales. Yet 40% of the team consists of recent college graduates," said Molaire. This new technology was invented by Dr. Rajarshi Chakraborty, a recent graduate of the University of Rochester. Molecular Glasses has the breadth and depth to make OLED materials really matter. Molecular Glasses™, OLEDIQ™,BOOster™,NONcrystallizable™, Molaicular™, Molaicular Inside™, ISOmeric™, HIentropy™, SurfaceJET™ are trademarks of Molecular Glasses, Inc.